Every season is great Uptown – and these last few weeks of summer will be the highlight of your year as you experience how your luck changes into the best one yet with winning chances that come from a duo of lucky bonuses and 350 Free Spins! 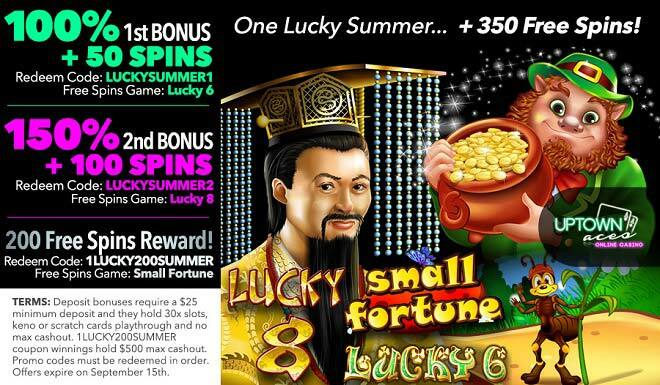 Here are a few reasons why summer is the best season: the beach, the best weather, no school, ice cream and Uptown’s hottest rewards: a 1st 100% Bonus + 50 Free Lucky 6 Spins, a 2nd 150% Match + 100 Lucky 8 Spins and 200 Small Fortune Free Spins Reward! If you’re a summer-loving person, then you’ll definitely love these hot, hot, hot days Uptown when you deposit as little as $25 to play with two sizzling bonuses and 350 Free Spins!